Benjamin Franklin once said that it’s easier to prevent bad habits than to break them. At Premier Dental Esthetics in Arcadia, we believe this is as true for dental hygiene as it is for anything else. For parents in the Arcadia area, teaching your children good oral hygiene techniques early in life will benefit their smile throughout their life. If you wait too long to teach them how to brush and floss, or if you don’t make sure they are doing it enough, you’re setting yourself up for a lot of work down the road. It can be hard to convince an older child that they should be spending two or three minutes brushing their teeth each morning and night. But, if they’ve done it for as long as they can remember, then their habits should be sufficient to avoid excessive dental decay. 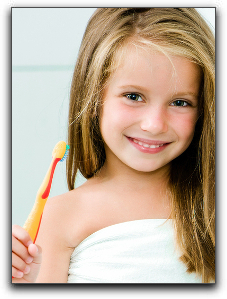 The best way to keep and maintain children’s dental health is with a consistent oral hygiene program at home, and visiting Premier Dental Esthetics in Arcadia twice a year for a cleaning and checkup. We provide family and cosmetic dentistry, and emergency dental care.